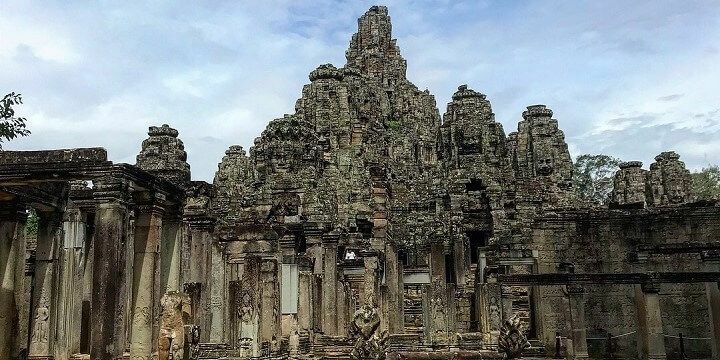 Famous for its Angkor Temples — Cambodia’s most-visited tourist attraction — Siem Reap, in the North of Cambodia, is a must-see for travelers headed to the country. While rainy season hits the city between May and September, Siem Reap tends to get fewer showers than the rest of Cambodia, making it a great year-round destination. Located inside of the 400 square kilometer Angkor Archaeological Park, the best-known of the Angkor Temples is the extremely well-preserved Angkor Wat. Marvel at the five sandstone towers, before heading inside the temple to enjoy the artwork and murals all around the site. While strolling through the surrounding gardens, watch out for monkeys: while these wild animals won’t hurt you, they will steal your belongings, if given the chance! The Angkor Archaeological Park is Siem Reap's most famous landmark. Many tourists stop after seeing Angkor Wat, but there’s much more to this park than its most famous landmark, and you don’t want to pay the 37 US Dollar entrance fee to see only one building. While inside the park, be sure to also check out Angkor Thom, the last capital city of the Khmer Empire. This site consists of a number of temples — the largest of which is Bayon — as well as an impressive entrance gate. Another must-see is Ta Prohm: with trees growing out of the ruins, this temple is famous for featuring in the Tomb Raider movie. 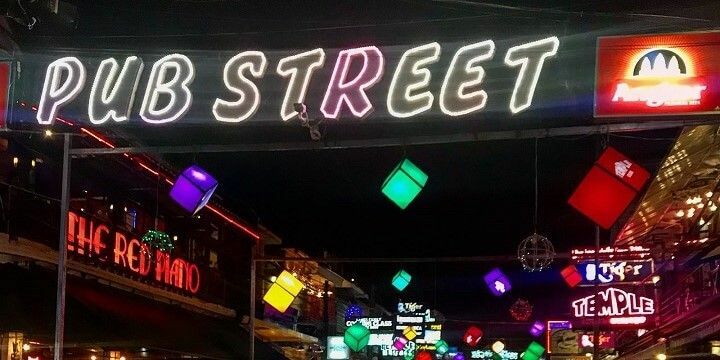 If you’re not too exhausted after exploring the Angkor Temples, check out Siem Reap’s Pub Street. Its year-round colorful light display illuminates the street, full of pubs, bars, and restaurants. Pub Street is a great spot at night. Pub Street is the perfect spot for those traveling on a shoestring, as nearly all of the bars host happy hours, with cheap beer and cocktails. If you fancy a snack, head to one of the many street vendors for rolled ice cream, banana pancakes, or even fried insects. Siem Reap has plenty of daytime shopping options; however, it’s best to hunt for a bargain in the evening, when the city’s many night markets open. One of the newest is King’s Road: with more upmarket dining options, this area is best-known for its genuine handmade goods, which are far more unique than the souvenirs you’ll find at other markets. Alternatively, check out the Art Center Market. Although its goods are a bit tackier, this market is well-worth a visit because of its spectacular lights, which reflect in its surrounding river. If you’d rather stay on Pub Street, you’ll find plenty of market stalls, selling lots of souvenirs, clothes, and jewelry. 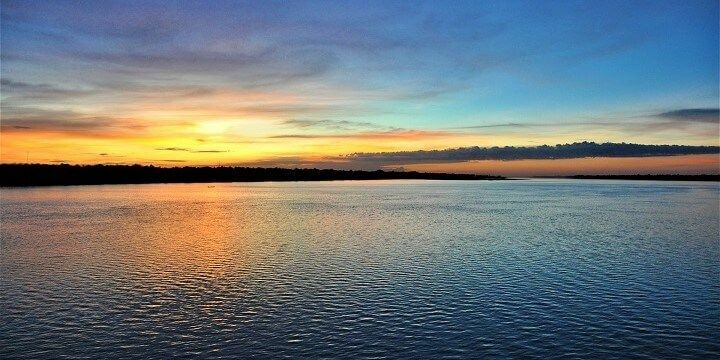 Drive about 30 minutes from Siem Reap and you’ll reach Tonle Sap, Southeast Asia’s largest freshwater lake. The best time to visit is during the rainy season, when its surface area expands to roughly 10,000 square kilometers. Tonle Sap Lake is Southeast Asia's largest fresh water lake. While at the lake, be sure to watch out for 300 species of fish, 100 species of bird, and multiple kinds of snakes, turtles, and crocodiles. Don’t leave without visiting Chong Khneas, the lake’s famous floating village, made up of houses, markets, schools, and clinics. For more incredible nature, travel about an hour from Siem Reap to Phnom Kulen National Park. The park’s most famous sight is the Kulen Mountain. At nearly 500 kilometers high, most tourists choose to take a van to the top to enjoy incredible views and impressive waterfalls. If NextStop24 helped you to choose your next travel destination, we'd be very grateful if you’d search for your accommodation and things to do in Siem Reap through these links. They're affiliate links, which means that we will receive a small commission for every booking made through them. There are no extra costs for you; you'll simply be helping to keep NextStop24 running. Thanks! Angkor Wat lived up to all the hype! I’d strongly recommend a private tuk tuk tour to get the most out of your time on the site, and see as many temples as possible!